Photograph courtesy Tom Jenkins 25165 & 24047 head a line-up of locomotives at Warrington Arpley. 25165 had last received major attention at Derby Works during April/May 1977. The almost fourteen year career of D7515/25165 was spent allocated to London Midland & Western Region depots. Boiler room grilles sheeted over (1977). Time between last Classified repair and withdrawal: 17 months. January 1965 to the Cricklewood Division (D14). August 1966 to Nottingham Division (D16). April 1968 to London Midland Midland Lines (LMML). January 1972 to Ebbw Junction (86B). 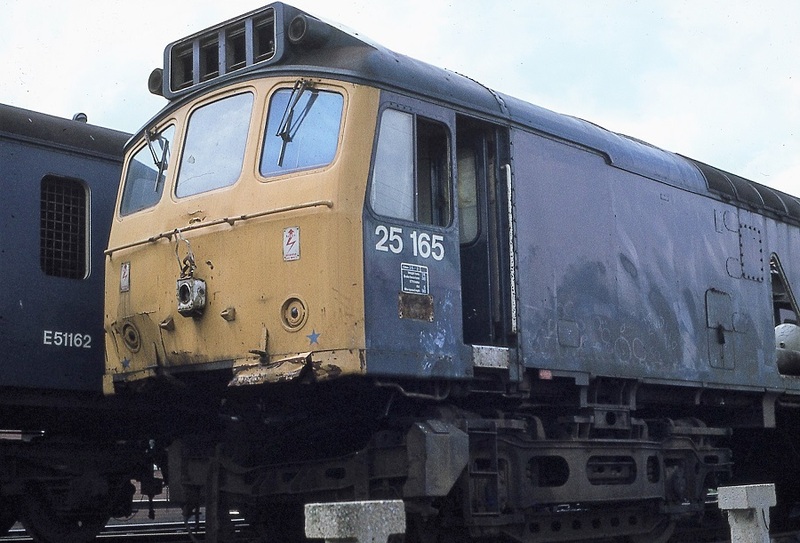 After withdrawal 25165 was moved to Derby Works early in 1979, its demolition was slow, being finally cut up during the middle of May 1981, although one cab remained at the Works until at least July 1986. The end of the road for 25165 at Etches Park during February 1979, showing the accident damage to the cab & bufferbeam which caused its demise. The damage is believed to have occurred somewhere in the Wigan area. Noted Derby Works March 1972. Noted Derby Works April & May 1977 (Classified?). The New Year began with the continued removal of withdrawn steam locomotives from various locations, on January 20th D7515 hauled Class 8F No. 48361 from Colwick to Drapers, Hull. Early railtour duty occurred on May 18th 1968 when D7515 worked a roundtrip Preston - Blackpool trip as part of a lengthier railtour 'N.W. Steam Tour' (Warwickshire Railway Society) involving much steam working in Lancashire & Cheshire. On the evening of June 2nd D7515 was noted passing Sleaford with an unidentified Skegness service. One of 7515/25165's earliest recorded passenger workings took place on August 3rd working a roundtrip Nottingham - Llandudno Town summer dated working. Condition May: two-tone green livery with full yellow cab fronts, exhaust located above engine room, 'D' prefix present. 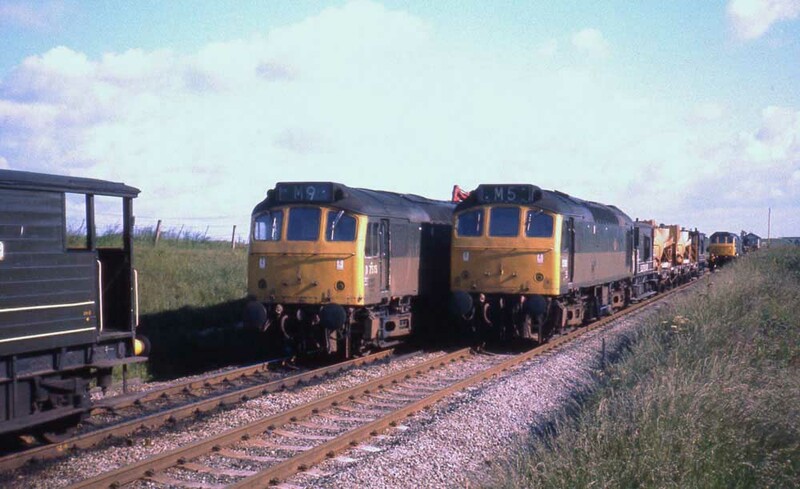 Photograph courtesy Tom Sutch On July 13th 1971 near Norton Crossing south of Warrington several engineering trains await their call to the site of this day's activities. In this view 5286 & 7515 wait for the call to move on this warm summers day. On June 13th 25165 & 25170 worked the lengthy Penyfford - Gunnie freight, which include considerable mileage under the wires. During 1975 25165 visited a couple of the east coast seaside resorts. On June 21st 25165 & 25259 worked the 14.15 Yarmouth - Derby forward from Norwich. Five days later (26th) the same pair were on a roundtrip Derby - Skegness run. On September 6th 25165 & 25072 worked the Derby - Norwich - Yarmouth - Norwich - Walsall diagram. On July 3rd 25165 & 25280 worked a Leicester - Yarmouth roundtrip, this being the start of the Leicester holiday period. An early morning Tyne - Millerhill freight was worked by 25165 on January 25th. The only recorded passenger working for 1977 occurred on August 21st when 25165 & 25131 worked the 08.45 Birmingham New Street - Barmouth forward from and returning to Shrewsbury. On January 28th 25165 & 24133 were on railtour duty working the 'Cambrian Coast Express' Euston - Barmouth special from Machynlleth to Aberystwyth and back to Birmingham New Street. 24087 worked the Barmouth portion. 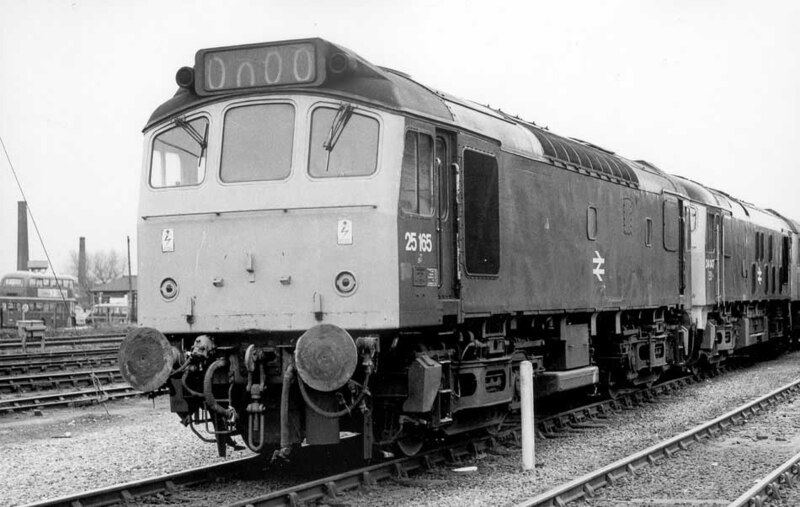 25165 was stabled at Birkenhead Mollington Street on March 25th along with ten other Class 25s. On May 9th 25165 was stabled at Birkenhead Mollington Street. On May 21st 25165 was noted passing Wedgwood (Halt), Staffordshire with the overhead line electrification (OLE) on May 21st. The final passenger workings for 25165 took place on August 9th with 25168 working the 10.45 Birmingham New Street - Holyhead forward from Crewe followed by the 19.32 Llandudno Town - Crewe. The end of the road arrived for 25165 after sustaining minor collision damage to the No.2 cab & bufferbeam. The damage is believed to have occurred somewhere in the Wigan area. 25165 was withdrawon on November 3rd 1978. Page added March 8th 2013. Last updated February 19th 2019.